Okemooor are an award-winning handmade food company in Okehampton, on the northern edge of Dartmoor National Park, Devon. Okemoor was first established 25 years ago and bought by Ray Wilson and Lynda McKenzie in 2001 and has been producing wonderful tasting artisan fresh food ever since. Okemoor sent me a delicious selection of pies, and tarts, both sweet, and savoury. When I’m sent larger amounts of food products to try out, I like to get my family round to dish them out, and to get a wider range of opinions. The resounding opinion of all of the pies were “yum!” and that the pastry was buttery and full of flavour – which is the #1 thing for a pie, in my opinion. It doesn’t matter how amazing the filling is, if the pastry isn’t up to scratch, it ruins the whole pie. The savoury pies are all cooked through completely, and can be eaten both hot and cold. I took photos before everyone arrived, and heated them up in the oven for tasting. After tasting the pies and tarts, I can see exactly why Okemoor are winners of several awards. Tender Devonshire chuck steak, cooked slowly with mushrooms and finished with stout. This one was a favourite with the boys – must have been the inclusion of the stout! The meat was plentiful and the mushroom slices were huge. Wonderfully moist chunks of local pork, chunks of Cheddar cheese with a homemade spiced apple chutney, complement the very flavourful creamy sauce. Encased in delicious short pastry with a nice flaky texture, this is a very good pie hot or cold. I preferred this pie cold, others preferred it hot, but since Okemoor say it is very good either way, this was another winner. A Ploughman’s Lunch is such a British meal, and all in a pie makes it perfect for picnics! Devon’s Boom Kitchen’s award winning curry mix, succulent British chicken and Langage Farm’s wonderful Yoghurt, combine to make this Award winning Okemoor pie – Gold: 2015 Taste of the West Awards. This was the clear “winner” for everyone on the tasting panel – the chicken curry was so flavourful, and encased in a pie is absolute genius. Lots of chunky pieces of chicken, and was tasty both hot and cold. Okemore use extra mature Cheddar cheese from a local supplier in their quiches. The ham used is hand cut and virtually fat free. Most of the vegetables are delivered daily. I think you could really taste the quality of the ingredients in this tart. It was not skimpy on the ham, and it didn’t even make it to the oven to warm up, as it was gobbled up before it got that far! Made with genuine frangipane, using fresh ground almonds rather than the often used ground peanuts and apricot kernels, this tart features a rich pastry base smothered with raspberry jam. It is finished with glacé icing feathered attractively with raspberry jam. Bakewell Tart is one of my favourite sweet tarts, and there was that delicious almond flavour running throughout this one. The pastry had a nice crumble to it, but not too crumbly so that it was falling apart in your hands. A delicious frangipane forms the base which is then covered with apricot pieces. Flaked almonds cover the top of the tart, finished with a light apricot glaze. I didn’t think I’d find a sweet tart that would top my love for Bakewell, but I found it in this apricot and almond tart! Same crumbly, but not too crumbly pastry as the Bakewell tart, same frangiapane flavour, with the addition of sweet apricots on top. Divine. An incredibly rich tart full of homemade caramel and walnut pieces, smothered in a seriously luxurious chocolate ganache. This tart was the all-round winner with my family panel of tasters. Seriously decadent and chocolatey, with a tasty crunch of the nuts on the base of the tart. Okemoor’s makes 9″ pies and tarts, as well as individual ones. Unless otherwise stated, all their pies can be frozen. 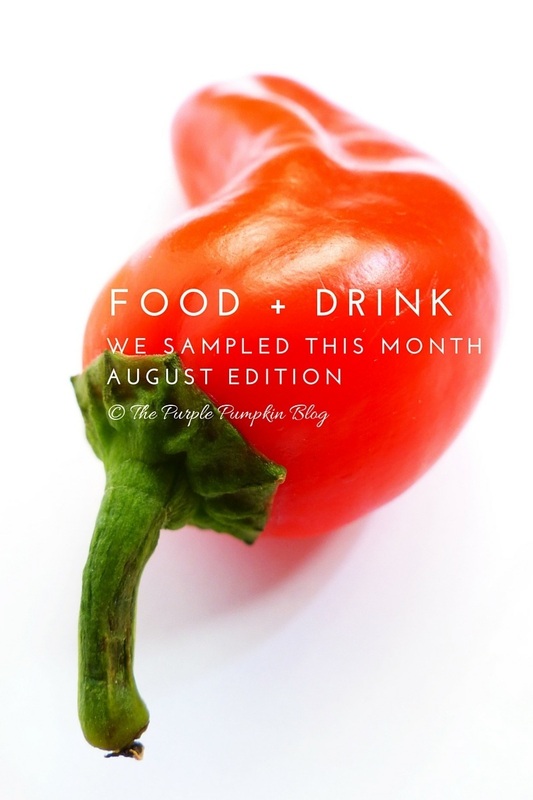 There are lots of tasty fillings, not just the ones that I have sampled here on my blog. The prices vary, with the individual ones around the £3.95 mark. They also make a range of desserts, puddings, cakes, and a new Italian range, including cannoli and Babà al Rum. With Organic September starting tomorrow, I was sent several organic products to try out. I can’t say I solely buy organic produce, but I do from time to time. 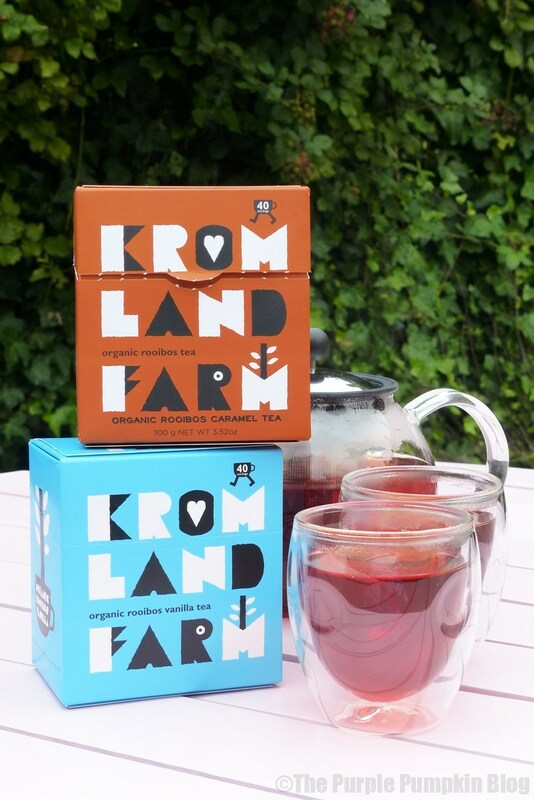 The first products were boxes of organic rooibos teas. Rooibos (redbush) is a full-flavoured herbal tea only grown in South Africa and cultivated in its remote Cederberh Mountains. It is low in tannin and high in antioxidants. It is thought to help with nervous tension, allergies and digestive problems. It is naturally caffeine free and can be enjoyed with or without milk. We brewed up a pot of both the flavours – Vanilla and Caramel. They were both refreshing, clean tasting and you could taste the caramel, in the caramel tea. However, we didn’t think there was much flavour difference between the two. We drank them without milk. With the leftover tea, we turned it into iced tea, which I personally preferred over hot. These snacks made a nice change from your regular snacks like crisps or nuts, as they are roasted, European grown, soya beans. 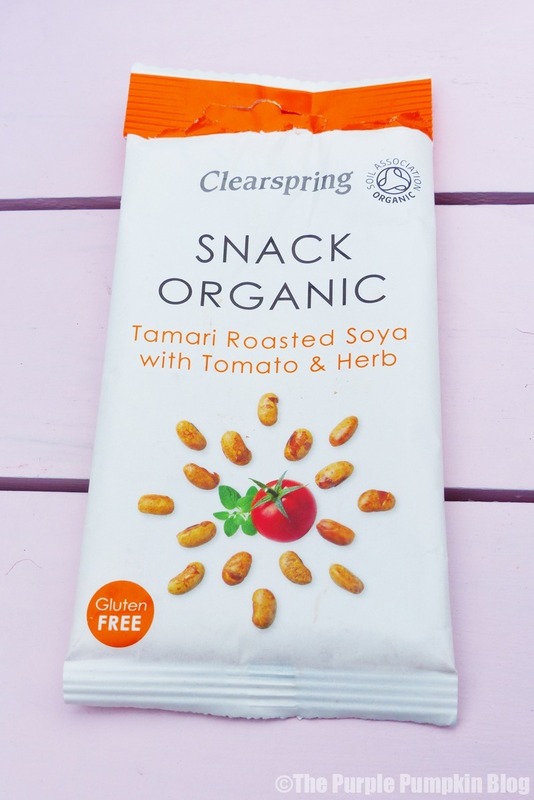 They are seasoned with Clearspring’s award winning tamari soya sauce, which is a double-strength, wheat-free and gluten-free. They are also high in protein and a source of magnesium. Available for 99p (RRP) at health food stores and on the Clearspring.co.uk. I purchase Nairn’s oatcakes from time to time, but I don’t think I’ve ever bought a box of their organic oatcakes before. All I can say about these, is that they were so tasty and moreish, that I to go out and buy another box of them to take photos, and of course, because we really loved the flavour of them! They suit both savoury (cheese especially!) and sweet topping. I ended up crumbling a few into my salad that I had for lunch one day too. 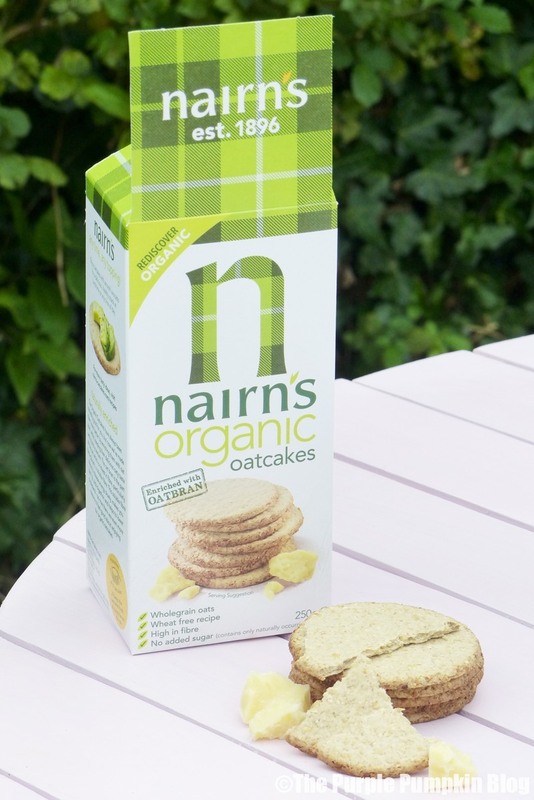 Nairn’s Organic Oatcakes are made with oats grown organically to standards set by the Soil Association. They are also wheat free, so they’re ideal for anyone limiting wheat in their diets. Wholegrain oats alone are a great source of soluble fibre, and the addition of extra oat bran – the most fibre rich part of the oat – helps to boost the benefits, aiding digestion lowering cholesterol and releasing energy slowly to make you feel fuller for longer. You can buy them for £1.09 (RRP) in Tesco, Sainsbury’s Waitrose, Holland & Barret, Ocado, Booths and independent health food stores. 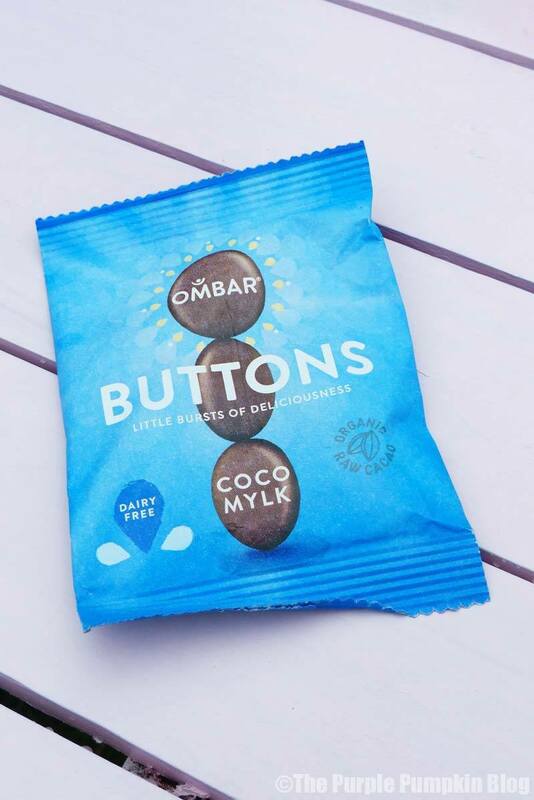 Ombar, the high vibe chocolate company, has launched new Coco ‘Mylk’ buttons, a dairy free ‘mylk’ chocolate that loves your health as much as you love a sweet treat. They are 100% natural, dairy free and vegan friendly. Wach pack is made using raw, organic cacao from Ecaudor and sweetened using organic coconut palm sugar, which is sustainably sourced from independent farmers in the Philippines. Upon opening, I could really smell the coconut, and I knew instantly that my husband wouldn’t like these, so it was down to me to do the taste test. I’m afraid to say, that I didn’t like the flavour of the buttons at all. They started out tasting of a very dark chocolate, which I like, but then a weird after taste came that I didn’t enjoy at all. French macarons (not to be confused with macaroons, which are an entirely different!) are one of my favourite sweet treats, and one that are a little bit indulgent, as they are quite expensive! 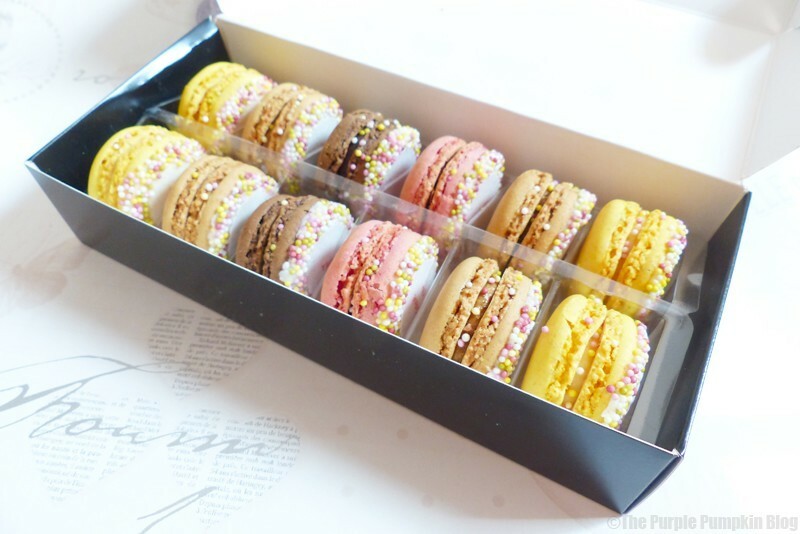 Cake-Cetera sent me a box of the cutest tiny macarons with 6 different flavours, 2 each of pistachio, raspberry , coffee, lemon, chocolate and vanilla. . The macarons came packaged very well, and they arrived undamaged, which I did worry about going through the post! My personal favourite flavour was the raspberry, followed by the chocolate. I thought the sprinkles were a nice touch, as was the personalised rice paper message on top of each one. A box of French macarons cost £14 – undecorated, or £18 for the decorated kind with message and sprinkles; plus postage, so they are not an everyday treat, but perfect as a gift to a loved one, to say thank you or to wish happy birthday, or just as a special treat to yourself! I do love a good soup – I enjoy making them, and I am not averse to buying them ready made, as they are perfect if you are in a rush! 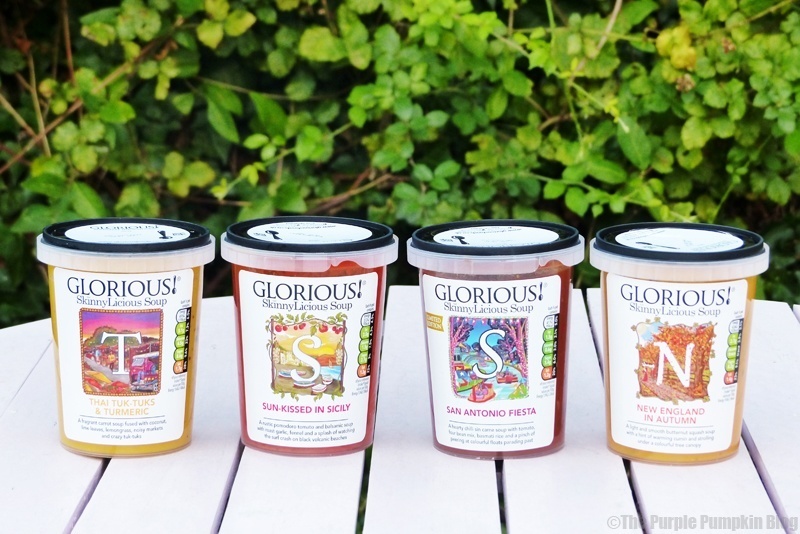 I’d not heard of GLORIOUS before, when they contacted me about their SkinnyLicious soup range, of which there are 8 flavours: Goa Express, More Bangalore, New Autumn in England, Persian Hug, San Antonio Fiesta, Singapore Fling, Sun-Kissed in Italy, and Thai Tuk-Tuks & Turmeric. They also have a range of meal soups, and Italian sauces. The names of the soups are so inventive, and a lot more exciting that saying “tomato soup”! Our local supermarket only had four flavours available which I bought with the vouchers I was sent, which was a shame, as I really loved the sound of both Persian Hug and Singapore Fling! I’ll have to look out for them in other supermarkets. Going by the name of this range – SkinnyLicious, you may well have guessed that they are made with the health concious in mind. They are less than 2% fat, under 150 calories per portion and every soup flavour in the range is completely vegetarian. Each pot has two portions, and they were a lot more filling than I thought they were going to be! New England in Autumn – a light and smooth butternut squash soup with a hint of warming cumin and strolling under a colourful tree canopy. Butternut squash is one of my favourite autumn vegetables, that I use to make soups often during the season. I felt that there could have been more of a smack of cumin, but that’s a personal thing, as it’s one of my favourite spices! Sun-Kissed in Sicily – a rustic pomodoro tomato and balsamic soup with roast garlic, fennel and a splash of watching the surf crash on black volcanic beaches. Of the four, this was my least favourite, maybe because I love a certain creamy tomato soup a bit too much, and this was just too light for me! San Antonio Fiesta – a hearty chilli sin carne soup with tomato, four bean mix, basmati rice and a pinch of peering at colourful floats parading past. This flavour is limited edition, but I do hope that they continue to supply it, as it was a tasty filling soup. I enjoyed the beans that were swimming about in the soup, as it gave it a delicious texture. Thai Tuk-Tuks & Tumeric – A fragrant carrot soup fused with coconut, lime leaves, lemongrass, noisy markets and crazy tuk-tuks. I’m not a fan of carrot soup, and my husband is not a fan of coconut, so just the ingredients list alone didn’t bode well for us and this soup. BUT, I didn’t find it over carrot-y, and he didn’t find it over coconut-y… the lime and lemongrass really took over on this soup, which was light and fragrant. For me, it was my favourite, which was a complete surprise as I thought the New England in Autumn would be my favourite! Overall, I think the soups were good. I do think there could have been slightly more seasoning, because whilst they were all flavourful, I felt that it could have been dialled up a notch to really pack a punch to my taste buds. When I think of low-fat soups, I think of watery concoctions with not much flavour, but these were the complete opposite, with them being nice and creamy tasting, and full of interesting ingredients and flavour combinations. I loved the packaging of the soups, the labels were bright and colourful and really stood out to the designer in me. I also loved the description of the soups, as they help to transport your mind to far-flung places, when really, you’re sitting at your desk, on a grey, wet afternoon, wishing you were somewhere else! This organic soya snacks are wonderful. I totally love them!